Hello former and potential Great American Mountain Rally (GAMRR) participants. I wanted to reach out to you about GAMRR2019. Obviously the untimely passing of Steve McKelvie has had a profound impact on the planning of the 2019 event. This event will be run October 25th-27th in honor of Steve; who was the driving force behind GAMRR2018. Steve provided a level of Rallying expertise that was extraordinary. I learned a great deal during the year that we spent together planning the 2018 event. With support from the New England Region SCCA and personnel from local sports car clubs I know that this event will rival & hopefully exceed last year’s event. Many have reached out to me offering support in running the event; to those my profound thanks. Steve and I had already established a preliminary route and had been coordinating with venues for lodging and events. Following is a preliminary route map. The current event includes 3 days of Rallying. Day 1 will start in the Capital District of New York State and run Northerly thought the center of the Adirondack Park to Lake Placid; the site of the 1932 and 1980 Winter Olympics. Day 2 of the event will include a loop from Lake Placid North and West to the Saint Regis and Saranac Lake Regions and will end back at our exquisite host hotel. Day 3 will see us travelling East through the High Peaks and Keene Valley to Lake Champlain where a short ferry ride will take you across the lake to Vermont. The last leg of day 3 will take us South through the Western edge of Vermont and the Green Mountain Forest. The culmination of the rally will once again end at Hemmings Motor News (our host from last year) in Bennington where scoring and awards will take place. Lodging in Saratoga Springs New York. A private wine and cheese reception at Saratoga Auto Museum (museum closed to the public). Approximately a 200 mile route to Lake Placid. Lodging at a fine Inn on Mirror Lake in downtown Lake Placid, including dinner in a private function room. starting and ending in Lake Placid. Sunday morning Breakfast at inn and start of day3. Approximately a 200 mile route to Vermont ending at Hemmings Motor News. As the event is developed a web site will be created where you can watch for updates and information about registering for this exciting event. Save the date Oct 25th-27th 2019! We are going to start selling off some of Steve’s rally computers, timers, and various other rally related stuff. He loved collecting and I’m sure he’d want these things to stay in the community. I’ve compiled a list and pictures of some of his collection. It runs the gambit from Halda Speed Pilots to rare Langwell and Steven’s Engineering ODOs. If you have interest in any of the items please email me and offer (pjfr at aol.com), otherwise we’ll start placing these items up on eBay. It’s with great sadness I must tell you that my father in law Steve McKelvie has unexpectedly passed. He had a love for anything mechanical since his childhood and when he was introduced to the rally community via my brother Mark, he discover an incredible outlet that combine his skill-set as and engineer by trade with a passion for cars. Over the 18 years I knew him I got to see just how much joy this brought to him. Thank you for reading this blog for which is was so proud of and for being one of his many friends across the globe. I can be reached at pjfr at aoldotcom if you’d like to connect or share a photo. Stephen McKelvie, 67 of Franklin (originally of Shelburne, Ontario) passed away unexpectedly on January 16th. He was the devoted Husband of Shanna (Ruteck), beloved Father of Laura (Johnson) and Father-in-law to Mike, adored Baba to his granddaughters Eliza and Huntley. He was also a loving son to Helen and her late husband Allan, Brother to Mary (Jones) and her late husband Patrick, Joanne (Jerome) and her husband Cliff. He will be missed by his nieces and nephews; Claire and her husband Fadil, David and his wife Ashley, Alex and his wife Chantal, and Sam and his wife Leanne. Steve, an engineer by trade and heart could navigate you through the pipes of cities across the globe by day, and by weekend, through some of the best driving roads in the world with the auto rally community he cherished. He will be greatly missed by many, but his legacy and memories of an inability to retell a funny story without keeling over and laughing before it got funny, will stay with us forever. Services will be held on Wednesday January 23rd at 11 am at Franklin Federated Church, 171 Main Street Franklin, MA, followed by a burial at St. Mary’s Cemetery, and a celebration of life. In lieu of flowers, donations can be made to the Franklin Federated Church. This could be a small reunion! 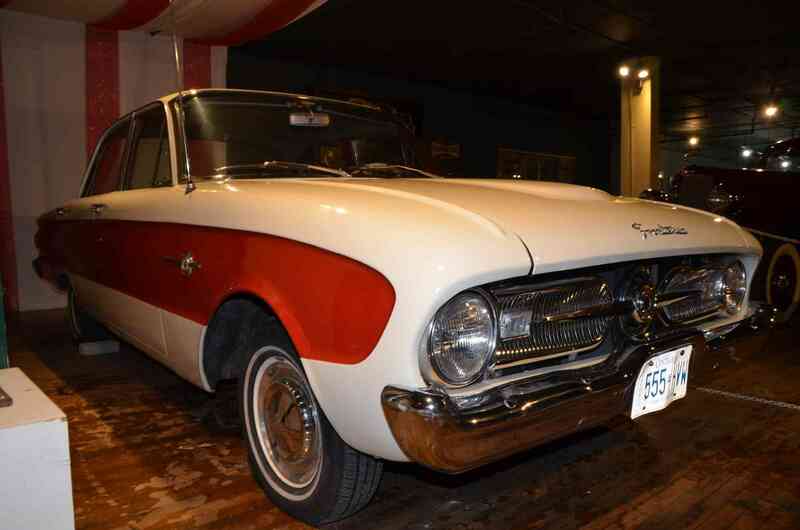 The Frontenac was a one-year only car that was sold in Canada only as a Canadian version of the 1960 Ford Falcon. I made far more complete postings about this car on January 25, 2018 and on July 4, 2018. From what I have read, there might be less than 20 of these cars still in existence. 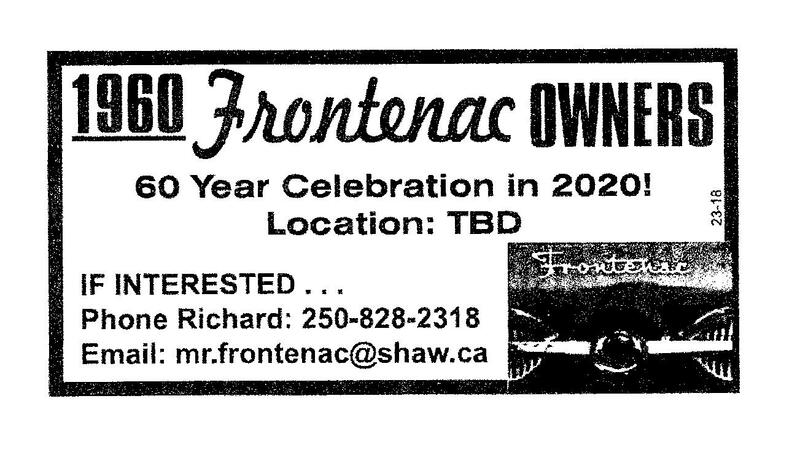 For details of the planned reunion for Frontenac owners and any others interested in this car then contact Richard as noted below. The Frontenac was simply a re-badged Ford Falcon. The re-badging consisted of several emblems featuring the Canadian Maple Leaf. I am interested in this car due to its rarity and its Canadian styling theme. I would like to get more pictures and stories about this car. I hope to see some pictures from the planned Frontenac reunion. Recently I posted a story that was published in the December 10, 1956 issue of Sports Illustrated about the 1956 Great American Mountain Rally. In that post I asked to be made aware of any other stories about the Great American Mountain Rally. 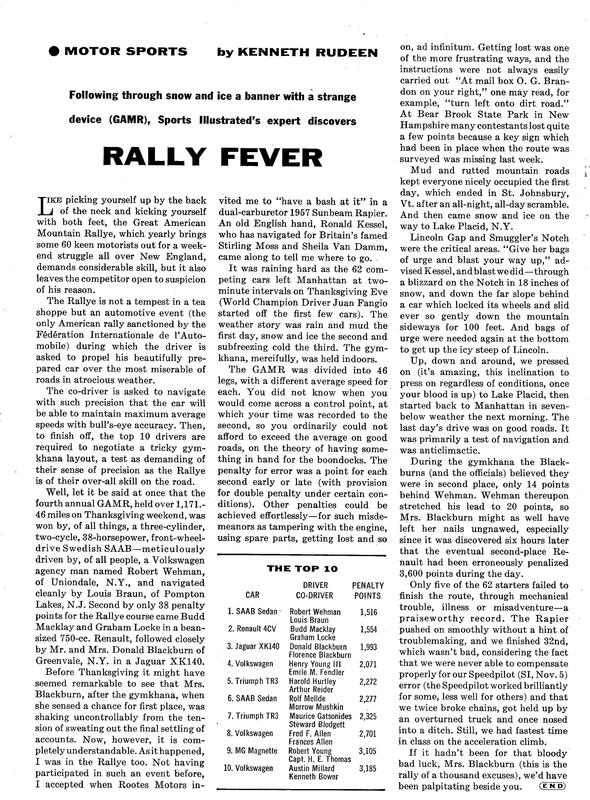 Well known rally man, Fred Gallagher of Rally The Globe in England, sent me a story that was written in Swedish, just after the finish of the 1956 running of the Great American Mountain Rally. I then took the original Swedish-language story and translated it into English. I made some modifications to the initial translation provided by Google Translate. As a result any errors are mine. The story is presented below. Saab-93 celebrated a new major competition triumph, when in November the car won the Great American Mountain Rally – an extremely tough road rally about 1,250 miles long. In addition to overall victory in the entire competition, Saab finished first, third and fourth in class (up to 750 cc cylinder volume) and also won the team prize. Sixty-two vehicles arrived at the start in New York on November 21. Of these, 50 finished the rally after three demanding day routes in the north-eastern mountain regions. The course was mainly on difficult alpine roads in the slopes of the Allegheny (more correctly, the Appalachian) Mountains. Three Saab cars were entered and were driven by two American drivers plus Rolf Mellde. All three Saab cars finished and the winner, Robert Wehman, made history by leading the rally from start to finish. Due to a linguistic misunderstanding with his navigator, Mellde finished the first day in 27th place. Thanks to a superb run of the remaining three days, he was able to move up and finished in sixth overall. The start in New York went at midnight and the cars drove that night and all the following day in a stretch to the first stage goal in the state of Vermont. The roads were very poor at the end of the stage, but in spite of this, the average speed often had to be up to 75 kilometers per hour. The second day of the rally included bad weather and a severe snowstorm. In 30 centimeters (6 inches) of snow and ice, the contestants had to, among other things, cross two mountain passes, one with such a steep climb, that Mellde said he had not previously run anything like this in Saab. He estimated the upward slope at 15-20 percent. 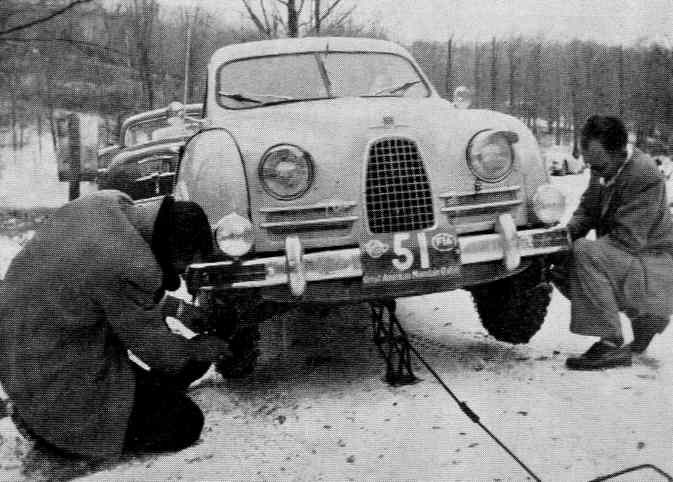 That stretch was the only one in the whole competition, where the Saab cars had to use their snow chains. The end of the second day was at Lake Placid, (a famous winter sports resort). In Lake Placid, the cars were parked outdoors overnight. The temperature dropped to minus 22 ° C, and the start of the third day morning made numerous difficulties for everyone except for the Saab cars. They immediately started all three, while some 20 of the other cars had to be towed. Following the finish in New York, the 10 top cars took part in the fourth day of an exclusive competition. Wehman also maintained his lead here and secured Saab’s first place in a close finish ahead of a Jaguar, the famous English sports car. Rolf Mellde came in sixth place, and the third team Saab car with a husband & wife team finished 17th. The Great American Mountain Rally is approved by the FIA ​​Federation International Automobile – and is considered one of America’s most demanding road rallies. In this year’s competition, about 20 different leading American and European car brands participated in all size and price categories, among the other cars were Porsche, Triumph, Volkswagen, Volvo, Renault, and Mercedes 300 SL. 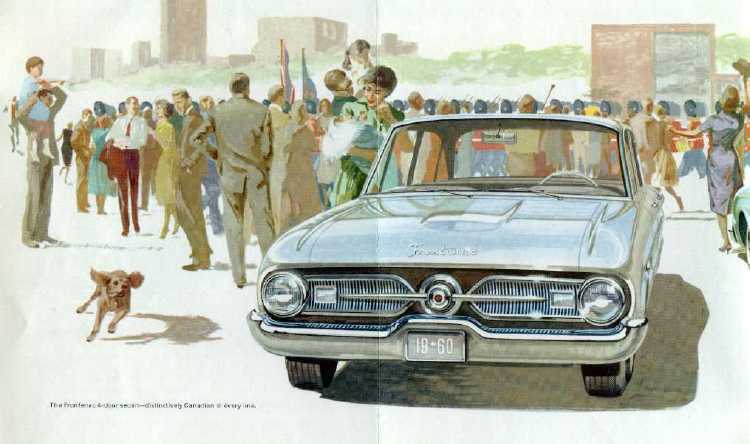 Of the American brands, cars with factory drivers from Plymouth, Ford, Buick and Studebaker also participated. My thanks to Fred Gallagher for sending me the story about the 1956 Great American Mountain Rally. It provides yet more information about this event. Recently I was contacted by Tim Wise who told me about a car that he has – a 1969 Mustang E. This is a car that I have never heard of. Apparently it was built by Ford specifically to compete in the Mobilgas Economy Run. In the 1940s, 1950s, 1960s the Mobilgas Economy Run was a popular and widely publicized motoring event. Also in the late 1960s there was the beginning of concern over fuel consumption by automobiles. 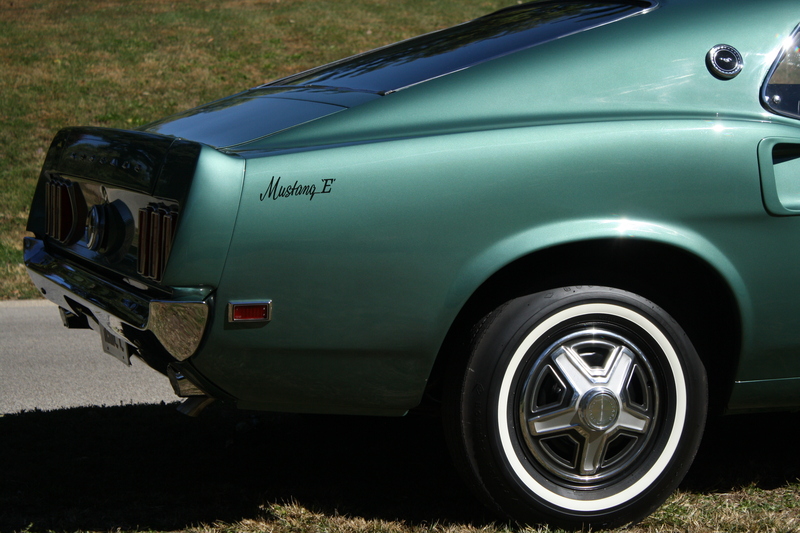 From a styling point of view, the Mustang E looks like the standard 1969 Mustang except for the “Mustang E” decal on the rear quarter panels. Tim’s car was very well restored by him and his wife over a four year period. The Mustang E was a basic Mustang as demonstrated that air conditioning was not an option with the Mustang E because air conditioning decreases gas mileage. 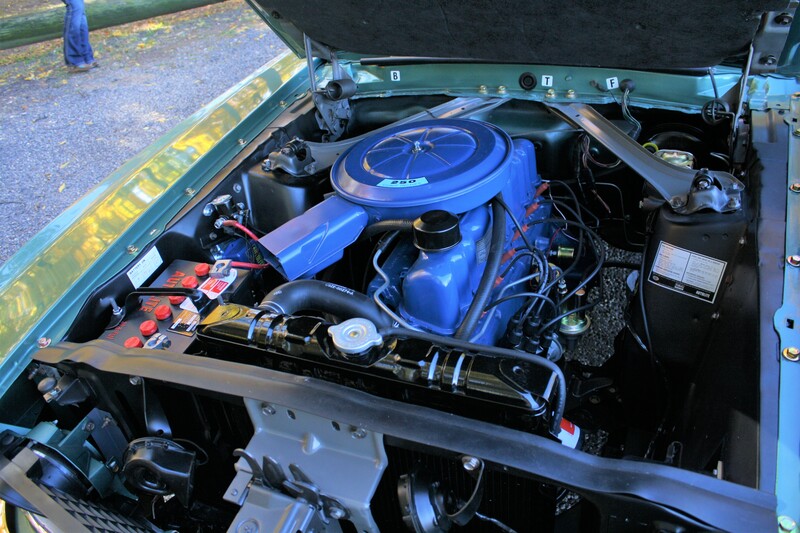 The 250 cubic inch 6-cylinder engine was new for 1969. The Mustang E cars came with a three-speed automatic transmission equipped with a one inch larger diameter than standard high stall torque converter and a very high 2.33:1 rear axle ratio. The engine was rated at 155 horsepower and with a torque of 240 pound-feet, identical to the standard six-cylinder Mustang. However with the special torque converter and higher rear axle ratio made the Mustang E significantly slower, but more fuel efficient, than the standard Mustang six-cylinder car. The Mustang E needed 13.3 seconds to reach 60 mph from a standing start and 19.4 seconds to travel a quarter mile. The standard six cylinder Mustang had a 0 to 60 mph time of about 10.6 seconds and would cover the quarter mile in 18.1 seconds. The top speed was 104 miles per hour. The Mustang E was rated at 19 mpg highway, 13.7 mpg city, and 16.3 mpg combined. 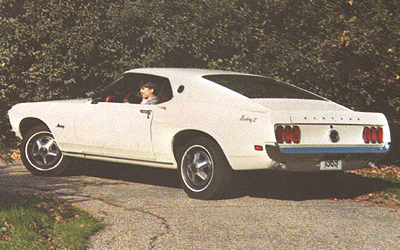 For reference, the standard Mustang six-cylinder model was good for 16.2 mpg highway, 12.9 mpg city, and 15.1 mpg combined. 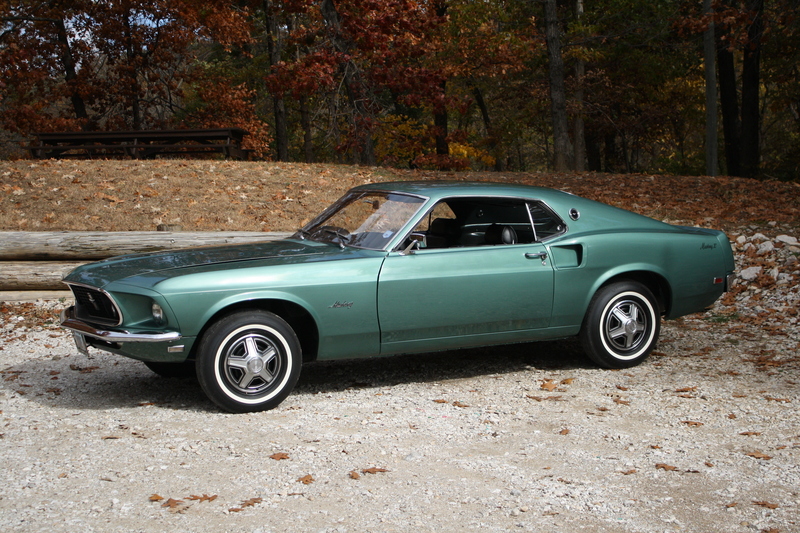 Ford only made 50 1969 Mustang E cars. For the Mobilgas Economy Run, the rules said “that cars competing in the Mobil Economy Run represent models being purchased and used by the public in substantial quantities”. A production run of 50 cars would satisfy that requirement. With such a small run, it is understandable that this model was not highly promoted by Ford. And unfortunately for Ford on December 20, 1968 the Mobilgas Economy Run, for which this car was built, was cancelled forever and Ford did not get a chance to fully showcase and promote this car. As only 5o 1969 Mustang E cars were built and as perhaps most buyers were not aware of the significance of these cars, it is suspected that only a very few still remain. For some years I have been searching for information about the original runnings of the Great American Mountain Rally. Recently Gary Hamilton found a report about the 1956 Great American Mountain Rally in the December 10, 1956 issue of Sports Illustrated magazine. The readability of the document online was not particularly good, therefore I started a search for an original copy of this magazine. I was surprised to find one on eBay quickly, so I bought it and it recently arrived at our house. I have scanned a copy of this report and have shown it below. As can be seen from the listing of the top 10 finishers, this was the year that a Saab team won the event, with another Saab entry, driven by factory driver Rolfe Mellde, finishing in sixth place. Another notable top 10 finisher was well known international rallyist Maurice Gatsonides in seventh place in a Triumph TR3. The truly rally-addicted people might also note that the navigator in the ninth place finishing position MG Magnette was Captain H. E. Thomas. Captain Thomas was the developer of the famous “Tommy Box”, which was a very early American rally “computer”. Also of interest is that the first few cars were flagged off by multi-time World Driving Champion, Juan Fangio! The Sports Illustrated report is a good one, but unfortunately car rally reports are not common in Sports Illustrated these days. One thing that hasn’t changed in Sports Illustrated since December 10, 1956 is the publishing of pictures of attractive young women in bathing suits, but enough said about that.